Little-Known Facts About Woodworking And Wood! With the holidays right around the corner, maybe you’ve already got your laundry list of gifts or gift ideas written out and taken care of. Some people, not us, are able to pick up things throughout the year that they think a loved one will really like. On the other side of the spectrum, you have your people who are just starting to think about what they will be giving people on December 23rd. Luckily, that second category doesn’t have to define you this year! Why? We’ve got cool gift ideas right here at The DIY Joint – gifts that you yourself could make for people, either for the holidays or just to let them know that you care. We have a woodworking class schedule which you should feel free to browse. Enrollments run between November 22nd (that’s today!) and April 21st, but space is limited so make sure you sign up soon. We also have woodworking course gift cards, so you could give the person you have in mind the gift of self-exploration and accomplishment. Our founder here at The DIY Joint, Priscilla Van Houten, started our woodworking shop in Hoboken NJ with the purpose of helping people rediscover a key element of their identity – that we are makers at heart. In this age of digitalization, it’s not a novel thing to hear people talk about how reliant, and perhaps addicted, to technology we as a society have become. But what you don’t hear discussed as frequently is what technology has replaced in our lives. For generations upon generations, humans have used our hands to create. Throughout history it’s been a core element of how we express ourselves. Sure, we now have modern comforts that make it possible for a good chunk of society to have “desk jobs” that don’t require them to break a sweat. But what if we’ve lost something about ourselves along the way? Through our NYC woodworking classes, we allow people the chance to express themselves in a way many New Yorkers never have before. Through guided instruction and encouragement, we want every NJ woodworking course participant to be proud of something they’ve made. And with our facility and instruction, you will be able to do exactly that, and learn a little something about yourself at the same time. It’s why we do what we do. And if you have someone in mind that could benefit from getting the gift of creativity this holiday, we have gift cards available now. So if you have been searching for some of the best gifts for New Yorkers, you now have your answer. 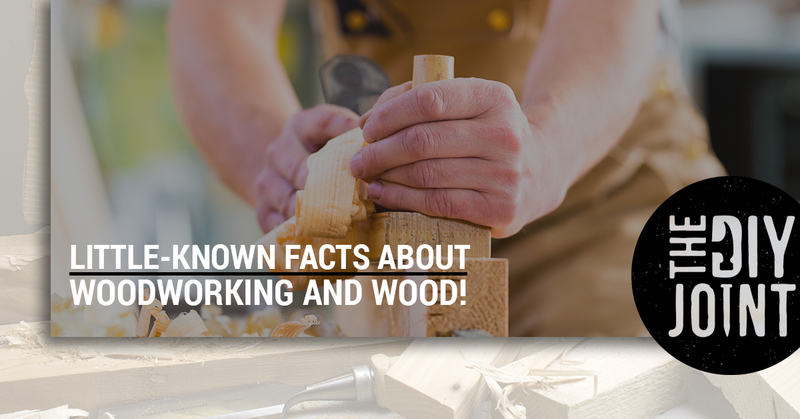 All jokes aside, read on if you are interested in learning some fun and perhaps surprising facts about wood, carpentry, and woodworking! Mahogany is a material that dates all the way back to the 17th century in Great Britain. It’s no surprise that it has maintained a presence in the world of fine wood to this day, as it is strong, easy to work with, and, of course, aesthetically pleasing. But, unfortunately, the tree sources which supplied mahogany were never replenished, which gives the wood its scarcity and de facto appeal. We may not be using mahogany in our carpentry classes in NYC, but that doesn’t mean we can’t appreciate a rare wood that handles polish easily and also glues quite well. Here is more of a woodworking tip than a fun fact about woodworking, so excuse us. When you are drilling a hole into a ball, it can be tricky to hold the ball in place. An easy work-around is to drill a small hole into a board to set the ball into while you are drilling the hole into the ball. This will keep it stationary and allow you to work with more precision. An easy way to prevent chipping while cutting plywood is to lay carpenter’s tape where you are intending to cut with your saw. The tape will reduce chipping and keep your saw aligned, too. Let’s talk about trees. Trees are amazing. Not only do they give us oxygen and serve as excellent materials that help us create with our hands, but they also have some pretty random, awesome qualities. For example, trees offer natural wind-proofing and shade. The offer so much, in fact, that the aggregate heating and cooling costs that all of the trees in the USA naturally provided were reduced by an absurd $2.1 billion. Some trees are able to talk to one another, in their own way. Willow trees, when threatened by pests, will emit a chemical warning to other trees in their vicinity. Using timber is an environmentally-friendly way to build a structure because timber is considered carbon-negative. Something is “carbon-negative” if it removes more carbon dioxide in the atmosphere than it adds. That’s good news, too, seeing as how over 70 percent of the developed world’s population lives in housing framed by timber! If you have your own woodworking shop, sawdust can become a significant issue if you aren’t proactive about your respiratory aids. Obviously it’s important to wear a mask if you are sawing, but that doesn’t make the air-quality any better. One alternative measure you can take to improve the air quality of your shop is to install a furnace filter in front of a fan. This will catch sawdust and other particles, making your space more clean and healthy to work in. So there you have it, some fun facts about trees, wood, and woodworking. We hope you have enjoyed today’s piece enough to remember one or two of these tips and facts for your next party. We are confident everyone will love you when you shout about timber being carbon-negative. Or, alternatively, you can get your woodworking fix by signing up for a DIY Joint woodworking class in Hoboken, NJ!